An heirloom tomato (also called heritage tomato in the UK) is an open-pollinated (non-hybrid) heirloom cultivar of tomato. According to tomato experts, heirloom tomatoes can be classified into four categories: family heirlooms, commercial heirlooms, mystery heirlooms, and created heirlooms. They usually have a shorter shelf life and less disease resistance than hybrids bred to resist against specific diseases. They are grown for a variety of reasons, such as for food, historical interest, access to wider varieties, and by people who wish to save seeds from year to year, as well as for their taste. Many heirloom tomatoes are sweeter and lack a genetic mutation that gives tomatoes a uniform red color at the cost of the fruit's taste. Varieties bearing this mutation, which have been favored by industry since the 1940s, feature fruits with lower levels of carotenoids and a decreased ability to make sugar within the fruit. 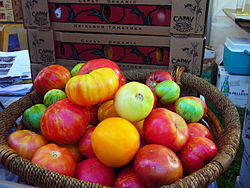 Heirloom tomato cultivars can be found in a wide variety of colors, shapes, flavors and sizes. Some heirloom cultivars can be prone to cracking or lack of disease resistance. As with most garden plants, cultivars can be acclimated over several gardening seasons to thrive in a geographical location through careful selection and seed saving. 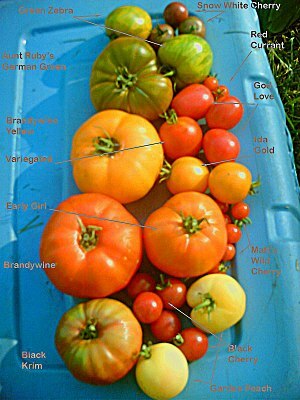 Some of the most famous examples include San Marzano, Brandywine, Green Zebra, Gardener's Delight, Marglobe, Lollypop, Yellow Pear, Silvery Fir Tree, Hillbilly, Paul Robeson, Cherokee Purple, Mortgage Lifter, Neville Tomatoes, Mr. Stripey, Costoluto Genovese, Pruden's Purple, Black Krim, Amish Paste, Aunt Ruby's German Green, Garden Peach, Hawaiian Pineapple, Big Rainbow, Chocolate Cherry, Red Currant, Matt's Wild Cherry, and Three Sisters. Heirloom seeds "breed true," unlike the seeds of hybridized plants. Both sides of the DNA in an heirloom variety come from a common stable cultivar. Heirloom tomato varieties are "open pollinating", and cross-pollination is common without human intervention. Heirloom seeds can be easily collected and usually almost all seeds will continue to show the traits of the original seed because this family of tomatoes almost always self-pollinates. Dramatic cross-pollination may occur in the presence of pollinating insects during flowering. Collecting heirloom seed is as easy as picking ripe tomatoes, chopping or mashing into a jar till less than half-full, filling with water, shaking from time to time and allowing to decompose for 1–6 days until seeds sink to the bottom, then rinsing until the seeds are clean, and drying. This decomposition is beneficial because it discourages transmission of diseases to the seed, the drying promotes better germination, and because the seeds are easier to separate when they are clean. ^ "Heirloom Tomatoes". Spiritfoods. Archived from the original on 22 February 2013. Retrieved 24 August 2012. ^ Scott, Sam (July–August 2013). "The Trouble With Tomatoes". Stanford Magazine. Stanford Alumni Association: 60. Retrieved 30 July 2013. ^ Gina Kolata (28 June 2012). "Flavor Is the Price of Tomatoes' Scarlet Hue, Study Finds". New York Times. Retrieved 28 June 2012. This page was last edited on 23 March 2019, at 15:41 (UTC).